Preheat the oven to 325 degrees and line a 8×8 inch baking dish with foil. Let two sides of the foil overhang on the baking dish (so it’s easier to pull out the cheesecake). 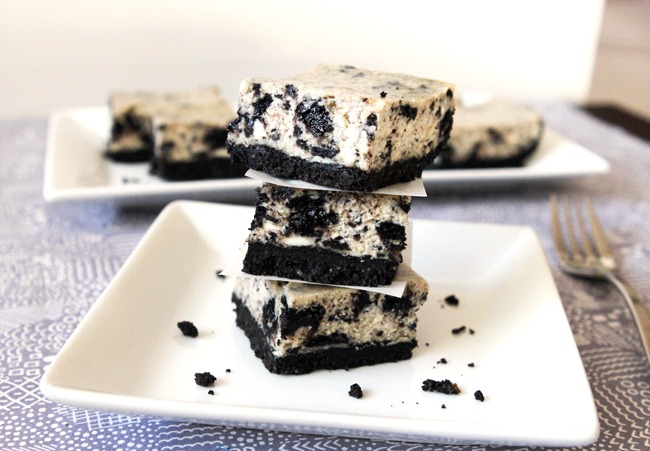 To make the crust, in a food processor, pulse the Oreos until they’re finely ground. Add in the melted butter and pulse until the cookies are moistened. Transfer the ground Oreos to the prepared baking pan and press the crumbs in an even layer over the bottom of the pan. Bake crust for 10 minutes then set aside while keeping the oven on. In the bowl of a stand mixer, beat the cream cheese on medium high until light and smooth, about 2 minutes. Then mix in the sugar until well-combined. Blend in the sour cream, vanilla, and salt. Then beat in the egg and egg yolk until well-incorporated. Gently stir in the chopped Oreos. Pour cheesecake batter over the prepared crust and smooth out the top with a spatula. Bake for 40 minutes, or until cheesecake is set around the edges but slightly wobbly in the center. Let cheesecake cool to room temperature, about 1 hour then cover the pan and refrigerate until well chilled, about 3 hours. I chilled mine overnight. To cut the bars, lift the overhanging foil from the pan and place it on a cutting board. Peel away the foil and slice into bars. Clean the knife blade after each slice to keep the edges pretty. Keep refrigerated until ready to serve. You may keep in an airtight container in the fridge for up to a week, if it lasts that long!